News from LMCU: Our Annual Hutt Scholarship Is Open For Entries! 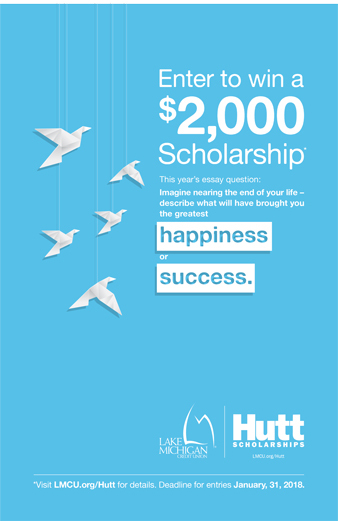 Our Annual Hutt Scholarship Is Open For Entries! Imagine nearing the end of your life – describe what will have brought you the greatest happiness or success. Essays will be judged on creativity, enthusiasm, clarity, and originality first, and mechanical or grammatical proficiency second. It’s open to all high school seniors. Interested high school seniors must complete an application online by clicking here.